Baca Architects have been appointed to design a flood resilient housing scheme of 12 units for a derelict flood prone site off the A3400 into Stratford-upon-Avon. Based loosely on our conceptual designs for a Flood Resilient Housing Scheme, commended by the Times Newspaper, the proposals bring together several strands of our flood mitigation research in a masterplan, using design and flood resilient house typologies, to create a unique, forward looking strategy, which will allow development to take place on this existing flood risk site. With views from the site across the river Avon, to the historic town centre conservation area, Baca Architects propose that the scheme demonstrates sensitive and high-quality design. 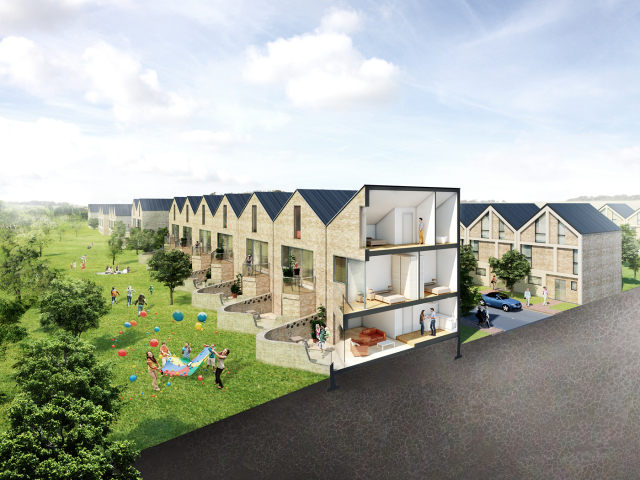 The development will create a collection of two and three storey town houses arranged in a series of terraces and mews settings. Having had positive initial conversations with both the Environment Agency and the town planners, Baca hope to develop the site in 2017 and create an exemplar, transferable model for housing schemes on other flood risk sites. In addition it will provide a solution to currently undevelopable, disused flood risk sites that can be found in towns and cities around the country.